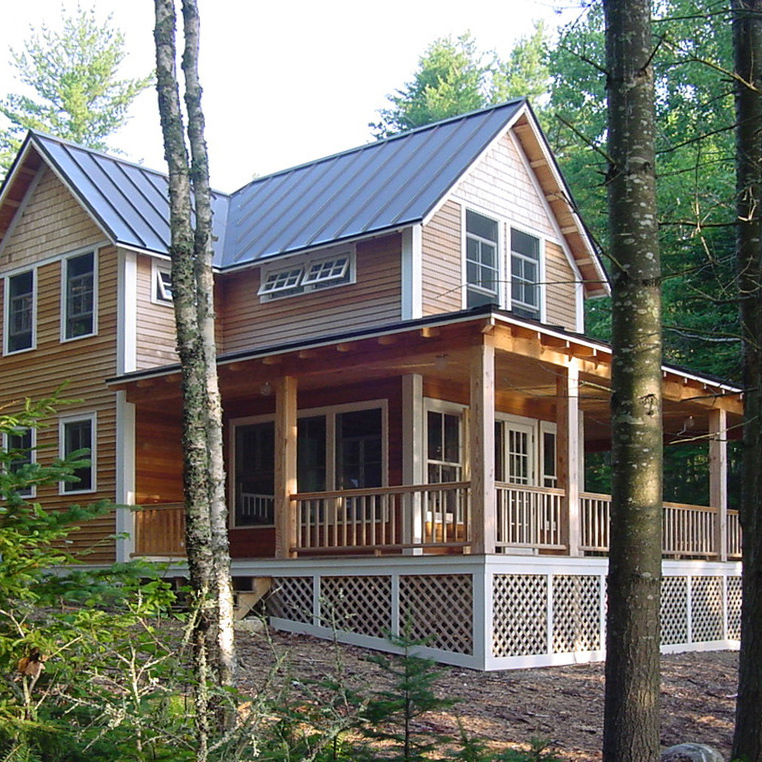 For years my firm has specialized in high performance, low energy-use homes for the northern New England climate. I have developed a wide knowledge of how to design and how to build super-insulated, super efficient, and super healthy homes. Much of my knowledge has been gained through working in a collaborative process with expert builders and people in the building science community and this is reflected in the clarity and build-ability of my plans. Purchase price on some plans includes limited consulting time to provide guidance and answer questions. I am offering a few of these plans here and will continue to create more. Modifications are also possible! Contact me with questions. Please note that all plans here are protected by Federal Copyright Law. We are always working feverishly to produce more plans and refine these existing plans. If you don't see something that fits your needs please don't hesitate to contact us! Vermont Simple House 4 is a compact house that can fit into any New England neighborhood or serve as a modern farmhouse. With its compact footprint, this house has the versatility to fit on a small in-town lot or look elegant high on a hill in the country. This design incorporates ultra-high performance specifications for a truly efficient, healthy living environment. With a full bathroom on the ground floor, it can easily be adapted for aging in place. VSH 4 combines a classic exterior aesthetic with an open, clean, modern-feeling floor plan. Purchase includes 5 hours of consulting time with Robert Swinburne, Architect. This house has a coastal aesthetic and can be used as a vacation home or for year-round living. It features a compact floor plan focused on porch living and a state-of-the-art energy efficient shell. This house can easily be expanded in a variety of ways without changing the overall character. Purchase includes 3 hours of consulting time with Robert Swinburne, Architect. This napping shack with a skeletal framework enclosed with screen and translucent roof has been featured in many books, magazines and websites. 18x24 printable sheet for study or use as a sales sheet. This is a PDF file to be printed at 18x24 and used to for closer study of the VSH4a house plan. This 16×22 tiny house can be used as an accessory dwelling for rental income, Airbnb, or a guest cottage, or it can be stand-alone for tiny house living. The plans are easily adapted to many types of construction including SIPs, ICFs and double stud walls. The loft is accessed with an alternate tread staircase – check your local codes to make sure this is allowed. Vermont Simple House 1 is a compact house that can fit into any New England neighborhood. The plan is designed for maximal flexibility. There is an option for a generous mudroom and suggestions for how to add on. and sneak peaks of upcoming plans.